We are involved in manufacturing of Chemical Centrifuge. Owing to the efforts of our dedicated team of professionals, we have been constantly engaged in offering the best quality Chemical Centrifuge Machine. We are manufacturer and supplier of the Cladding Centrifuge By SS Material for chemical plants at required thickness and sizes of 24", 36"and 48 inches. Pusher Centrifuge of International standard , several models to suit your product. This continuour pusher centrifuge will reduce your labour force, number of units required, floor space, operational workload in addition to saving on spillage of your expensive products. Ease of operation and efficient performance will increase your productivity at lower unit cost. 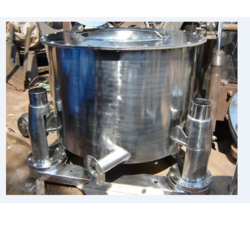 a) Inverting Filter Centrifuge will discharge solids free of any residual heel, protecting and preserving the grain structure of the Product, hence multi purpose application. 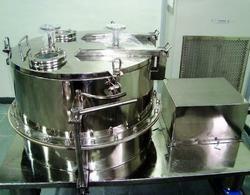 We offer an array of 4 point centrifuge, which are available in various size and type. Our range of centrifuges is made using qualitative material such as SS 316, halar & PFA coated. This equipment is available in two sizes 24" and 60" and of two types, top discharge and beg lifting types. With fixed angular rotor heads of 15 ml tube capacity and 5 steps speed regulator.